Photos by Bob McConville: Orange, a playful sub adult, frolics in the waves near the Jolley Bridge. Everybody loves dolphins! They always seem to be smiling and they glide with ease through the water, jumping and playing as if there is not a care in the world. Their social structure is unique that this species merits special attention. They are being studied worldwide so we humans can better understand their ability to communicate with each other, learn about their social habits and why, in general, they do what they do. 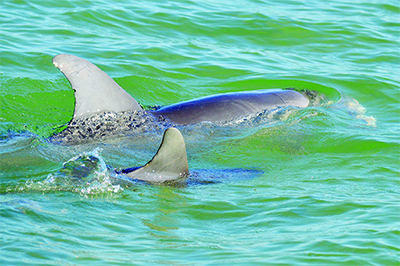 In February 2006, a new program began in the Marco Island area involving the study of bottlenose dolphins that are found in the general vicinity. A research center in the Florida Keys has been established for some time, and Mote Marine Laboratories in Sarasota also monitors the population in their bays and estuaries. Here, the 10,000 Island Dolphin Research Project is on the job and has compiled some interesting information. a few sub adults (not yet fully physically mature) may increase their range as well. The Project’s study has shown that birthing season in Marco’s waters is primarily in the fall and early winter months. 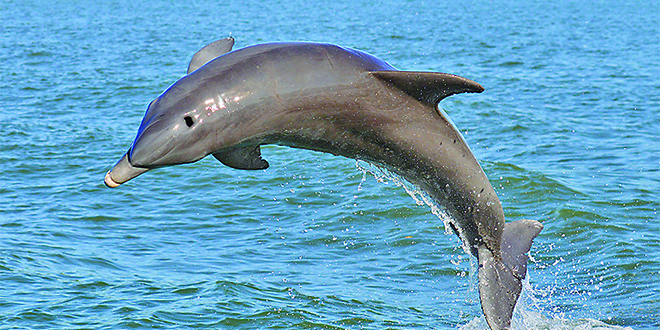 Since September, seven dolphin calves have been sighted primarily in the Marco River and adjacent back waters. Let’s meet a few locals and learn their stories. Adult female Nibbles gave birth in the area of the Jolley Bridge in 2007 to a new calf named Jayson. Both mom and baby stayed in that area while Jayson was young. In 2012 Nibbles gave birth to Coco, and something unique took place. Not long after the birth, mom and her newborn relocated about five miles north of the bridge in the Intracoastal waters close to Channel Marker 33. They stayed there for four years, until this past summer. Nibbles returned to the Jolley Bridge area again, leading the survey team to speculate that she might be pregnant. Sure enough, Nibbles gave birth to Popcorn a few months ago! Not long after this birth, both mom and her baby made that journey, just as with Coco, and they are seen in the waters nearby Channel Marker 33. Interesting! Halfway, with a fish in her mouth, keeps a careful eye on her three-month-old calf, Wyatt. team. These three pairs are Hatchet and Capri, Bangle and Finch, Captain Jack and Trixie (yes, Trixie is a boy). During mating season, which coincides with birthing season in this area, some of these boys will not be seen for a period of time. Chances are that they have left the immediate region in search of females in a not too distant location. For example, Captain Jack and Trixie were not sighted for over a month, but were spotted back in local waters just prior to this publication. There are so many stories to share regarding these very special mammals. The Project has been involved with the rescue of two dolphins in the last four years, both of which had fishing line tangled around the tail fin (fluke). The first grandmother has been identified in area waters and one of the adult females has given birth to five calves that we know of, one each year in 2004, 2007, 2010, 2013, and again in 2016…every three years like clockwork. To learn more about these incredible creatures please join me on January 11th at Rose History Auditorium for a one-hour talk. The program begins at 7 PM. Come see how dolphins are identified and enjoy a slide presentation showcasing more about Marco Island’s bottlenose dolphins! Bob is the owner of Stepping Stone Ecotours, and is a naturalist for this dolphin survey team. 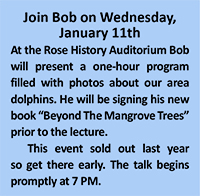 His new book “Beyond The Mangrove Trees” is available at several locations throughout South Florida. Bob loves his wife very much! Log on to steppingstoneecotours.com for more information.